Chelydra serpentina (snapping turtle); photo by aposematic herpetologist on Flickr (noncommercial use permitted with attribution). The snapping turtle (chelydra serpentina) has a relatively small shell that does not cover its limbs or tail (snapping turtles cannot retract their heads under the shell). 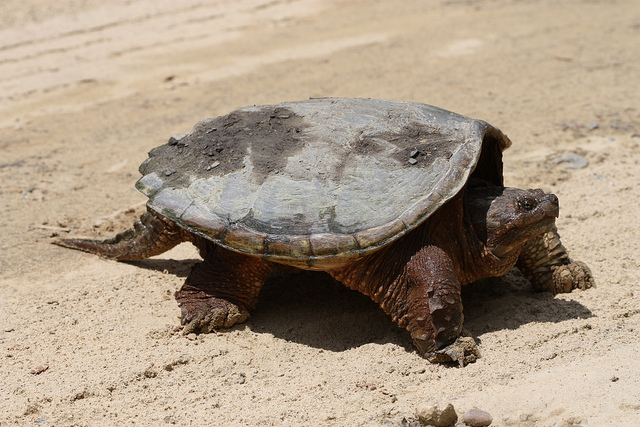 Snapping turtles can grow quite large - with shells exceeding 18 inches and weight over 35 pounds. Color varies from light green and brown shades to very dark green and brown. Largely nocturnal, the snapping turtle is omnivorous - about a third of its diet consists of plants, but snapping turtles are also aggressive predators, lying in wait to ambush prey. Snapping turtles have a hooked beak which can slice through the flesh and bones of its prey (small aquatic invertebrates, crayfish, snails, fish, frogs, toads, snakes, bird eggs, small mammals, carrion, and water birds). 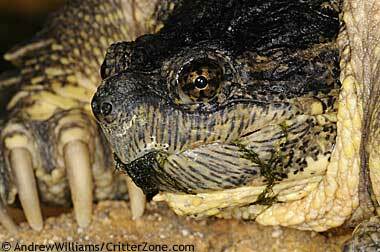 Snapping turtles can live up to 60 years and are known for their fierce, menacing behavior. They are found in lakes, ponds, marshes and slow-moving streams (any permanent body of fresh water is a potential home). 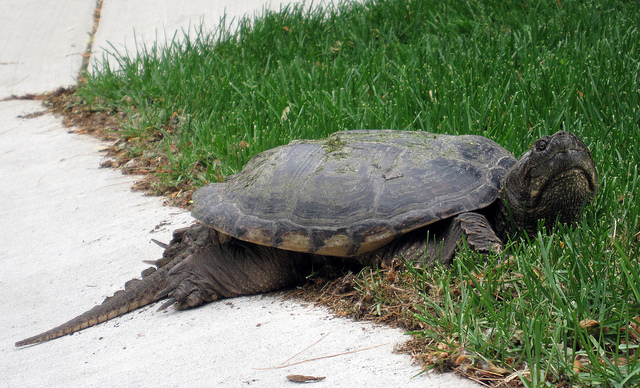 Female snapping turtles have been known to journey 10 miles to reach their traditional nesting area. Many hatchlings fall prey to raccoons, skunks, snakes, bullfrogs, herons, and other large birds. Snapping turtle portrait; photo © Andrew Williams / Critterzone: Animal Pictures, Nature Stock Photography (all rights reserved; used by permission). Snapping turtle; photo by Brian Adams on Flickr (noncommercial use permitted with attribution / share alike). Aggressive snapping turtle. Don't blink at 1:00! Video of Aggressive snapping turtle. Don&#039;t blink at 1:00!